Aha! There they are…sleeping right through their own 20th birthday! That’s right—Woodland Park Zoo’s grizzly bear brothers, Keema and Denali, turn 20 today, and they are celebrating with a big ol’ snooze. Winter is a time of torpor for these bears, which means their activity level is low and their interest in our party horn shenanigans is non-existent. Brothers hanging out at 1 year old in 1995. Photo: Woodland Park Zoo. 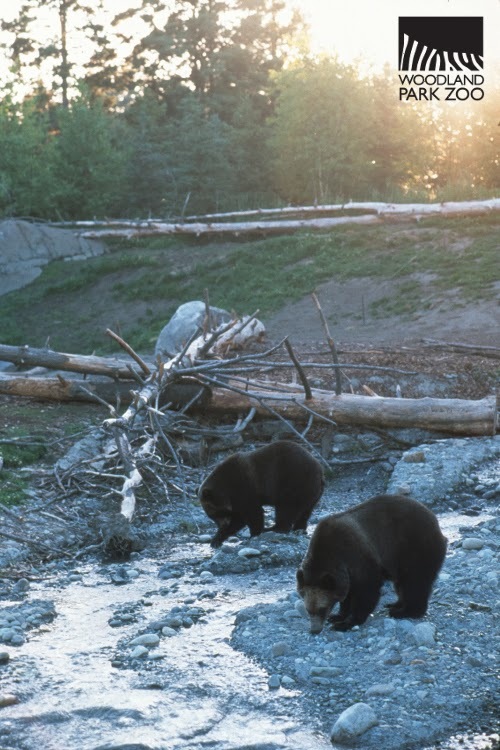 That’s Keema and Denali at one year old exploring their Northern Trail home, opened in 1994. Cut to 2014 and the 20 year olds each weigh in at just over 850 pounds. My, how they have grown! Brothers still hanging out as adults. Photo: Ryan Hawk/WPZ. 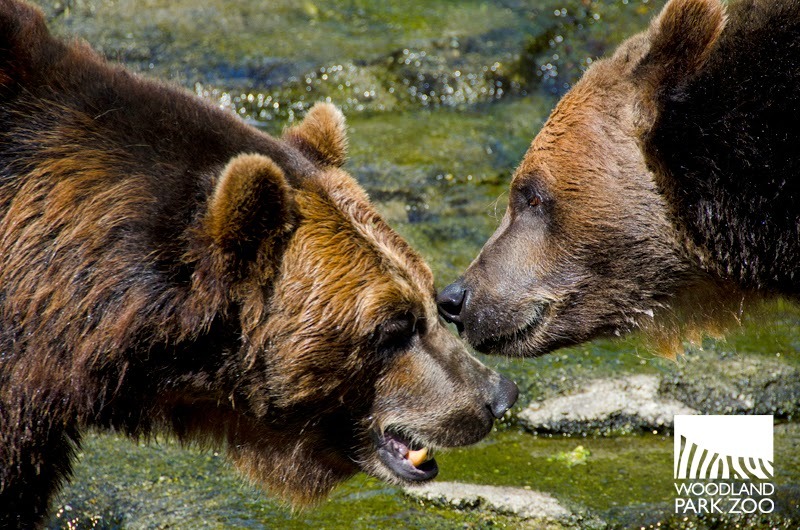 It’s uncommon for two adult grizzly males to live together as harmoniously as Keema and Denali do. As twins, they've been together since day one and are comfortable in each other’s company. But let’s face it, if we ever introduced a lady into the mix, things would certainly change! That they get along so well 20 years on might be due in part to their complementary personalities. Keema has the more dominant, active personality, while Denali is more laid back. 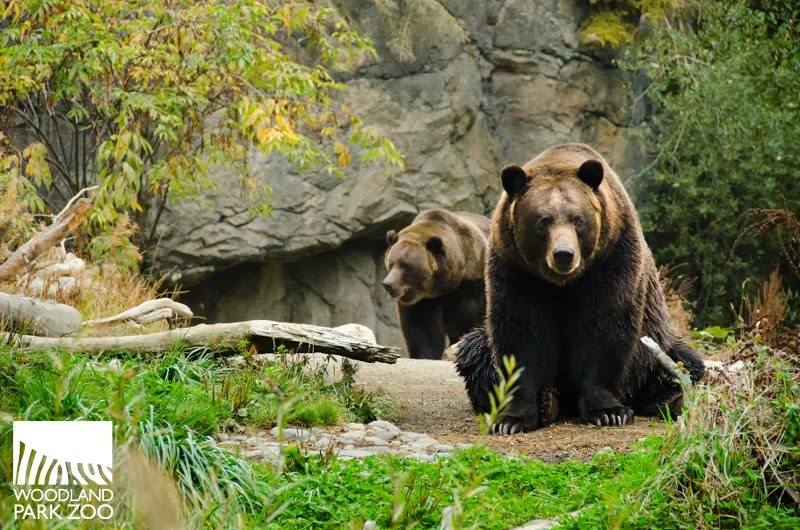 If you are ever watching the bears and see one exploring all over the exhibit, while the other is slumped over a log or curled up for a nap, now you know which one is which! Keema’s lighter patch of fur on his right shoulder is visible here. Photo: Dennis Dow/WPZ. There are physical differences too, though they can be harder to spot. Keema has a lighter colored patch of hair on his right shoulder that distinguishes him at a glance. In the winter when their fur is a dark chocolate color, it is easier to notice. 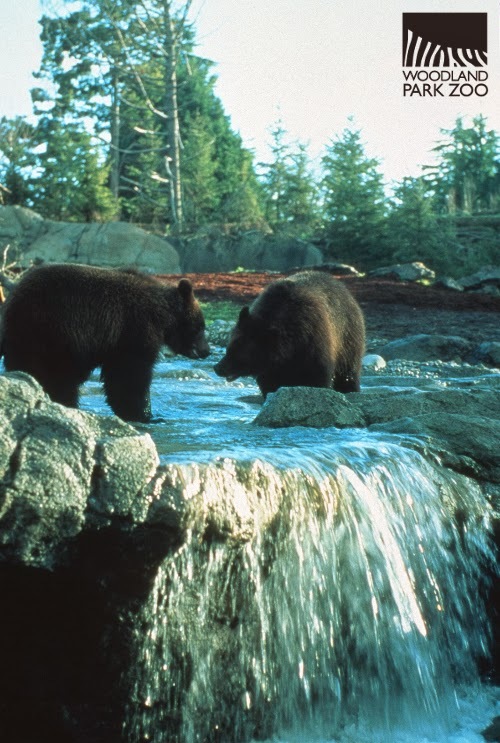 It can be harder to spot when both bears get a lighter, milk chocolate coat in the summer. That’s why the which-one-is-slumped-over-a-log test can be the easier route! If the bears weren't sleeping through their own birthday, what treats might they have looked forward to? Winnie the Pooh knows what’s up. Hunny Honey is the ultimate treat for our bears. 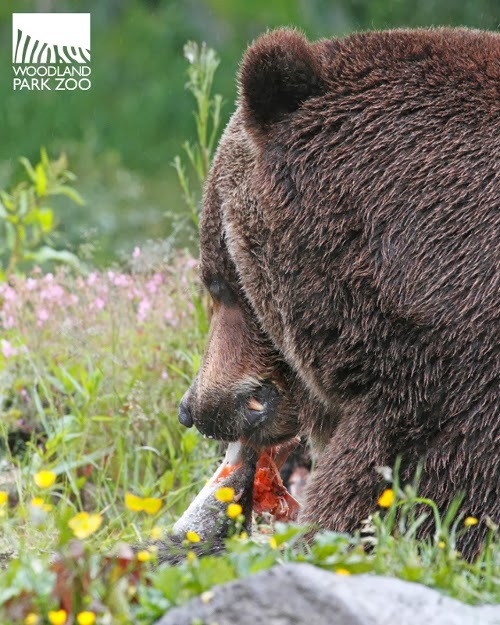 But this delicacy is used only rarely for training so that it doesn't lose its potency as the snack for which the bears would do absolutely anything. What else then? You can’t go wrong with a hunk of salmon. But their sweet tooth always wins out in the end, and the ultimate satisfier in between those rare honey treats is fruit! Not just any fruit—these bears have geographically appropriate tastes. No citrus or bananas for them; they prefer apples, grapes and berries. And if those berries are in the form of a pie, even better! Photo: Woodland Park Zoo. Grizzly bears are known to live 20-25 years in the wild, so we know our boys are getting up there. Yet they are healthy and fit, and going strong for their age. They even manage to surprise us still. Like when the keepers came in one morning just a few weeks ago and found that at least one of the bears went on a fishing expedition overnight and ate all the live trout in the exhibit pool, despite the bears’ state of winter slumber. So maybe they’ll shake off this lazy morning and join in on our party after all. Sleeping bears still sleeping. Photo: Ryan Hawk/Woodland Park Zoo. We’ll plan some special, belated-birthday treats for the bears at the start of spring when they begin to stir. You only turn 20 once, but we’ll make an exception for our favorite nappers. 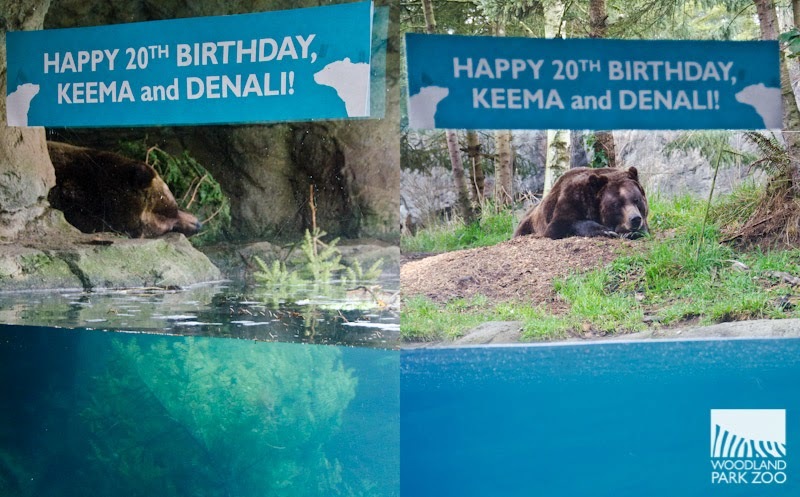 Happy birthday, Keema and Denali! Keema and Denali in 1995 at 1 year old. Photo: Woodland Park Zoo. Awwww, happy birthday big boys. Happy birthday!! May they live long and flourish!